This is a completely customized University of Georgia and Auburn University wedding cake topper ordered by one of our customers. 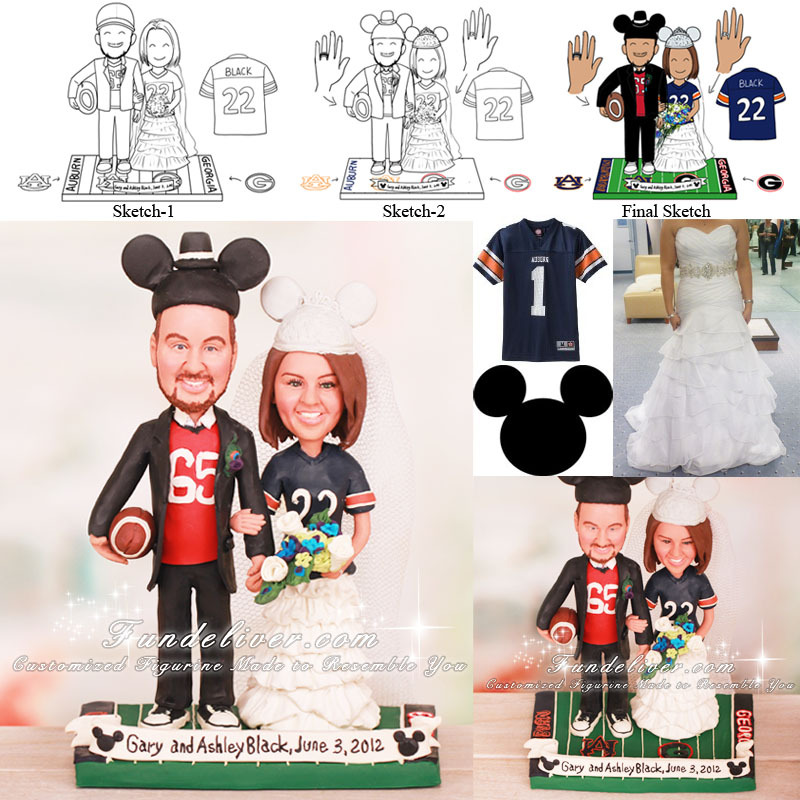 They would like their figurine to be standing on a football field, with groom in a #65 University of Georgia jersey with black tuxedo pants, holding a football and bride in a #22 Auburn University jersey on top of her dress (showing only the skirt of the dress) holding a purple and teal bouquet. The groom is wearing a boutonniere and black patton leather chuck taylor's. The names on the back of the jersey's read "Black". In the groom's endzone they would like it to read Auburn in the orange and blue and in the bride's endzone they would like it to read Georgia in the red and black. They would like the opposing teams logo in front of the bride and groom on the field. They would like the AU symbol in front of the groom and a Georgia G in front of the bride. Since they are getting married at Walt Disney World and they would like that to be incorporated in the topper. 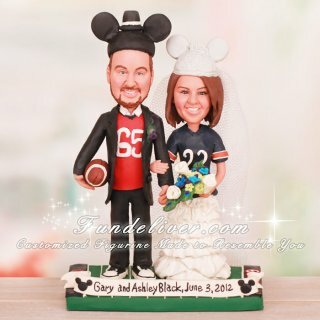 They would like the groom and bride figurine to have a Mickey and Minnie wedding ears on and a nameplate with Mickey head outline on each side of the banner saying "Gary and Ashley Black, June 3, 2012".